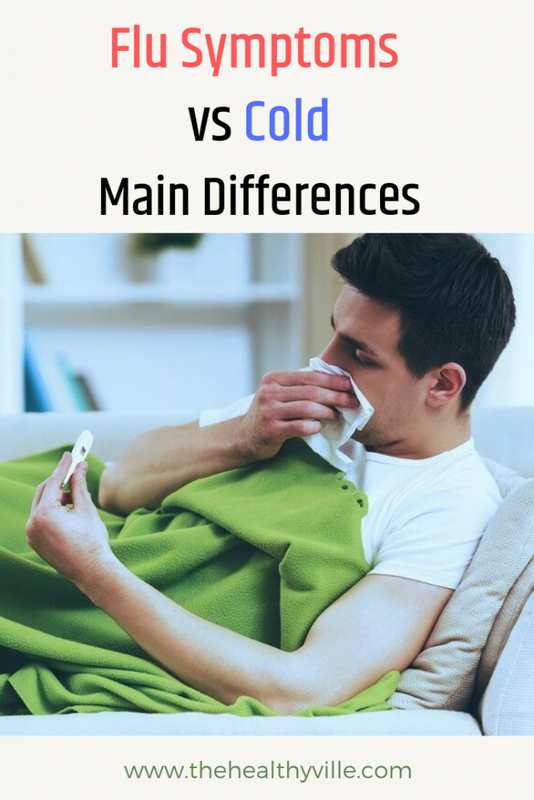 Do you know the differences between flu symptoms vs cold? Though they are very similar, these two diseases are quite different. Although they are two pathologies that are very similar, in fact the flu and the common cold have many differences. The viruses, the diagnosis and also the treatments that the specialist will impose are different. Before the appearance of physical discomfort that affects the respiratory tract, the obligatory question is: is it the flu or cold? Both conditions are a viral process, which means that viruses infect them. What are the causes of the flu symptoms vs cold symptoms? 200 viruses can cause the common cold or catarrh; instead, the cause of the flu is the virus influenza. These viruses can be transmitted with relative ease, since they are present in the environment and on any surface, where they can live up to 24 hours. Also, those who have already have it can transmit it to other people through coughing, saliva and sneezing. Existing vaccines are usually for flu strains A and B, because they are considered to be the most virulent strains. Its application to the vulnerable population is recommended once a year before the winter season; They are considered vulnerable to the elderly, pregnant, sick, workers in the health sector and children. The cold causes a moderate affection in the nose and throat. In regards to the flu, it can affect the respiratory tract in general, but also cause physical discomfort throughout the body. As for the climate, the cold can be had at any time of the year, although it is not as frequent in summer. In contrast, the flu is usually very seasonal and spreads more in the winter season. The most common symptoms of a cold are nasal congestion, shortness of breath, sneezing and coughing. You can also feel the throat and a slight increase in body temperature that does not become fever (up to 37.5 ºC). The symptomatology of the flu includes nasal congestion to a lesser degree, pharyngeal pain and cough. Feeling of exhaustion, muscle pain and headaches; high fever appears, that is, higher than 38.5 ºC. This symptomatology makes a difference in terms of severity. The flu is more exhausting than the cold; however, both can have complications that seriously affect health and life. Since both conditions are caused by viruses, the treatment is symptomatic, that is, it only seeks to alleviate the symptoms. The disease has a certain cycle of days, longer in the case of influenza than the cold, and there is no treatment to shorten that period. It is not a bacterial process, so antibiotics should not be taken, except when complications arise and always prescribed by a medical specialist. Do not self-medicate for the prevention of this type of pathologies. Only medical personnel have the professional qualifications to treat these diseases. The treatment includes decongestants, antitussives, antiallergics or antihistamines, expectorants, mucolytics, analgesics and anti-flu, depending on the case. How do doctors diagnose them how long they last? In general, the doctor only needs a description of the symptoms to diagnose these diseases. At your discretion, you may request blood tests and pharyngeal swabs. The common cold is considered fast recovery; It can extend up to five days from the onset of symptoms, which will appear progressively. The discomfort derived from the flu is increasing rapidly. This disease lasts between 7 and 15 days, although there is a great typology of very different cases. If either of the two diseases lasts longer than they should, you should ask for medical help immediately, in order to avoid major complications. An excessive period of time of the flu or catarrh should be cause for medical consultation; complications include otitis, bronchitis, pneumonia and sinusitis. These diseases constitute a different clinical picture, both in its approach and in its treatment. The physical rest. The body is busy fighting the disease from within, so the body will need the greatest number of energies available. To consume abundant liquid, to help to fluidify the mucosities and to alleviate the congestion of the airways. Further info: Treating Flu Symptoms At Home With Propolis As Your Natural Antibiotic Is The Best Option! See Why! The use of humidifiers is very beneficial. A dry environment favors the proliferation of bacteria in the respiratory tract. When it comes to body cleansing, be it flu or catarrh, to minimize infection it is advisable to wash your hands frequently. Also maintain a good hygiene in general. Don’t forget to SHARE the flu symptoms vs cold symptoms with your friends and family on your social networks!